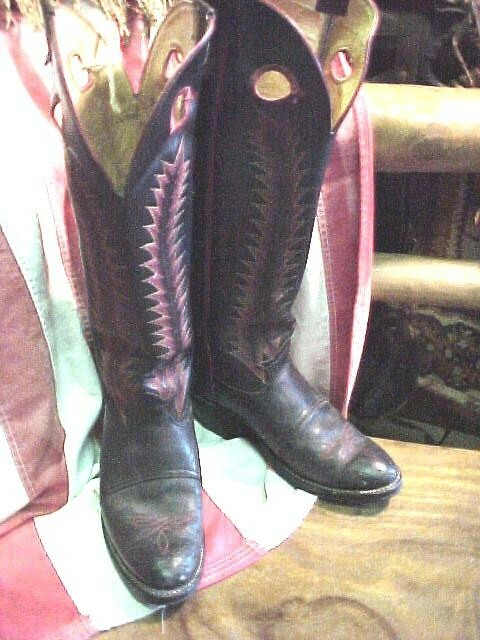 Here is a great pair of Custom made Texas Old West Cowboy boots. Size 9 Red stitch in Black boots. Like new. This is "the look." Wear them or Display, Great! Here is a great pair of Custom made High Top Texas Old West Style Cowboy boots. Size 9 wtih Red stitch in Black Leather. Like new. This is "the look." Wear them or Display, Great! Please email cowboyron@cowboycabin.com with questions or call 406 270-2842.